So the first thing that I'd like you to know about this review is that I rarely do product reviews. I'd much rather spend my time hunting down deals for you. But when I read about the SkyBell, I was so intrigued by the simplicity and cleverness of the technology, that I actually approached SkyBell about doing a review. For the sake of full transparency, I will disclose that I purchased a SkyBell at a reduced price in order to review it, but the discount that I received in no way influenced my opinion. 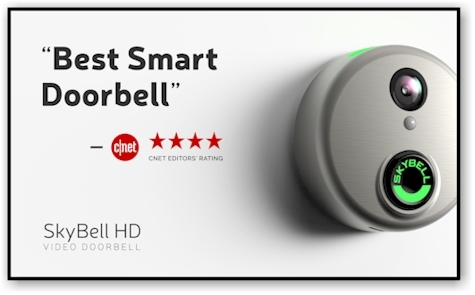 Here's how the SkyBell works: it replaces your actual doorbell. When a visitor rings the SkyBell, your regular doorbell still rings, but you also get an alert on your smartphone with the SkyBell app. You can see who is at the door via a tiny camera in the SkyBell and you can hear and speak to the visitor through your phone. So you can be on vacation or at work and if someone rings the SkyBell, you can respond and they will never know that you aren't home. Next, we had to sync the SkyBell up with our WiFi, which, again, was easy and took another 5 minutes. We then downloaded the app on to our smartphones and tablets: Android, iPhone and iPads; all easy to set up. If two or more people are monitoring the SkyBell, you basically share one login, and while all of you will receive alerts when someone rings your SkyBell, only one of you can answer and talk to the visitor. You can also set up multiple SkyBells on one account, so if you have several entrances (front door, side door, etc.) or if you own more than one property, you can install SkyBells at each entryway and monitor them all via one login. FYI, if your WiFi goes down, and your SkyBell is hooked up to a conventional doorbell, then it will still work as a doorbell (but you won't receive alerts until the WiFi is back up again). If your SkyBell is ever stolen from your front door, the company will replace it free of charge. If you move, you can take your SkyBell with you; just remove it and re-install the regular doorbell. You don't need to set up your account or smartphone apps again. Just reinstall the SkyBell at your new residence and sync it up to your WiFi and you're good to go. After we installed it came the fun part: testing it out. You can set the SkyBell up to send you an alert both when someone rings the doorbell and when someone sets off the SkyBell motion sensor. 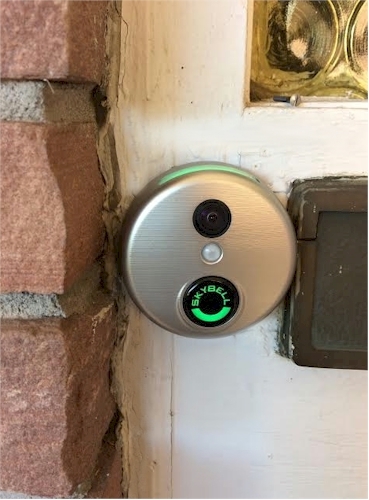 We decided to use the doorbell alert only for daytime, and add the motion detection alert at night, so that we would know if someone decides to lurk around our front porch or scope out our entrance after dark. The alerts worked perfectly, exactly as they were supposed to. You can control the sensitivity of the motion detector; it automatically filters out environmental stimuli (like ambitious squirrels) to avoid a false alert. You don't have to use the motion sensor, but if you do and are a Shomer Shabbos family, remember to turn it off before Shabbos. When we go on vacation, we are going to turn on the motion sensor and leave it on 24/7. Once that's on, there's no way that I can think of to get to our front porch without being detected and recorded, even if the visitor doesn't ring the doorbell. You can also activate the camera at will, so that at any given time I can see what's going on at my front door. 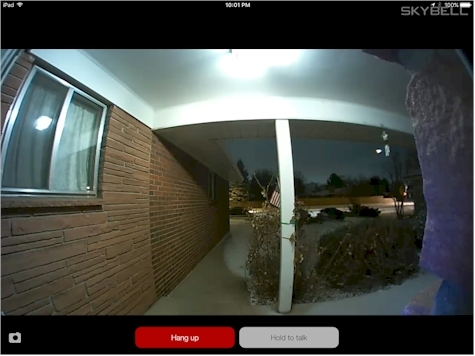 Yesterday, when I came home after 10:30 p.m. from grocery shopping, I activated the SkyBell camera right before I pulled in to the driveway, to make sure there was no one waiting for me on my porch when I came in the door. The alerts are automatically recorded as videos, and if you are watching the alert from your phone app, you can snap a still-photo as well. SkyBell saves these videos on its server (and doesn't charge you for video storage like other smart doorbells do), and you can seamlessly download the videos and images to your smartphone's camera feed, so you can easily email them to the police if you need to, or even post them on social media. The SkyBell HD camera goes up to 1080p. The video is H264 x 30FPS HD with a 180 degree field of view. Full-color night vision up to 15 feet. The frames per second depend on your WiFi connection speeds. I took a screenshot of the monitoring of our front porch at night. This is what it looks like on my iPad app. The HD image is nice and clear. The remote door-answering is what sold me on the SkyBell. This week, I've already answered our doorbell several times when I was far away from home, and I'm waiting for the "this is so insanely cool" feeling that I get each time to fade away. There is a tiny delay in the back-and-forth communication with your visitor, but the overall sound quality is pretty good, better than most intercoms that I've used. You can control the outgoing sound volume (low, medium or high). Please note that you cannot actually unlock your front door via the SkyBell. You can set the SkyBell up so that when you have a visitor, the interior doorbell won't ring, but you will still get a phone alert. This is useful if you've got a noise-sensitive sleeping baby, or if you work at home and don't want to be disturbed by doorbell, but still want to know who's ringing it. Quiet Mode is also a great feature if you've got a dog that goes insane at the sound of the doorbell. If you've already got a home security system installed, the SkyBell will work with many of them. You can integrate the SkyBell with third party packages like Honeywell's Total Connect 2.0, or even Amazon's Alexa, Nest, IFTTT, Kevo, Alarm.com, Monitronics and more. In terms of value, I'm going to do a little rave here. Unlike almost all alarm systems, there are no monthly fees for anything with the SkyBell HD. You buy it, you're done, and you can still receive software updates and video storage for free. The cost for the SkyBell HD is $199.00, which IMHO, is ridiculously low for the value it offers. You can buy it for $199.00 from SkyBell.com, Amazon, Home Depot, and Best Buy. While it doesn't replace a full burglar alarm system, the SkyBell HD has absolutely raised our level of security and has definitely given me increased peace of mind. If you've got kids or if you travel often, you are going to love it. 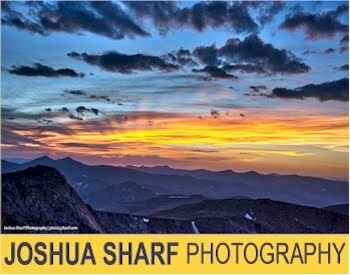 The Big Finish: your exclusive discount! The SkyBell HD costs $199.00 everywhere, but from 1/4/17 to 1/12/17 only, Daily Cheapskate readers are going to get an EXCLUSIVE discount from SkyBell.com. Click here,and enter promo code DAILYCHEAPSKATE25 at checkout and your SkyBell HD will drop by $25.00 to $174.00 with free shipping. Because of the discounted price, there is limit of one SkyBell HD per customer at this price. 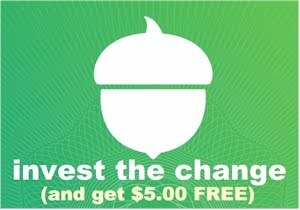 SkyBell reserves the right to cancel the order or promo code discount at any time. SkyBell ships to USA addresses only.